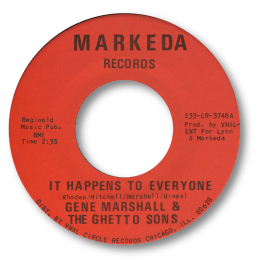 This may be the only disc by Gene Marshall and the Ghetto Sons, but It Happens To Everyone is a side that ought to be much better appreciated. The wah-wah guitar in the background gives the track an early 70s date, as does the name of the group, but its waltz time spirit is somewhat earlier than that. Marshall’s poignant – even wistful - delivery comes directly from the heart, and the way he muses and moans at the chorus is quite moving. The quavery trumpet/trombone brass chart adds to the mood as well. A delicate artistic success. This 45 has connections with the Lynns/Reginald labels from Greenville, MS and was almost certainly cut in the South. Is this the same guy that cut two R & B singles for Preview? Can anybody help? UPDATE ~ Dante Carfagna writes to say that this 45 was cut in Chicago for the tiny King James label owned by by Jimmy Mitchell, a club-owner who was murdered in the early '70s. The Markeda pressing was used for Southern sales via the Little Lynn organisation. NEW UPDATE ~ Takeo Tamaki writes to say that he has a copy of the King James 45 which has Pt 2 of "Obe Shirt" not "It Happens To Everybody". I've amended the discography accordingly. Thanks to Dante Carfagna (see Links) for the new info.